Hurting people want a God who is big enough to rescue them from heartache and circumstances beyond imagination. But even if they believe that such a God exists, they may have no idea how to approach him, much less how to ask him for the impossible. 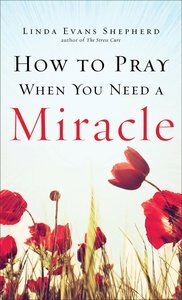 In this powerful book, Linda Evans Shepherd shows readers how to reach out to God and ask for a miracle. She shows how God's miracles may not come packaged in the ways we would expect, but they do come in ways that will transform our lives. This book will be a comfort to those who struggle with faith yet still dare to believe that God cares. Through solid biblical teaching and real-life stories of answered prayer, Shepherd walks with readers on a journey to renewed hope and the assurance that God still works miracles. About "How to Pray When You Need a Miracle"
Linda Evans Shepherd and Eva Marie Everson are both award-winning authors, successful speakers, radio personalities, and avid readers of fiction. They are the popular authors of The Potluck Club, The Potluck Club--Trouble's Brewing, and The Potluck Club--Takes the Cake. They've also led numerous Bible studies and women's retreats and still find time to be wives and mothers. Linda lives in Longmont, Colorado, and Eva lives in Casselberry, Florida.